William Gibson (born as William Ford Gibson in Conway, South Carolina United States) is a famous Writer from USA, he is 71 years old and still alive, born March 17, 1948. 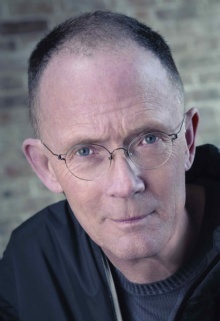 William Ford Gibson is a Canadian and American author, known especially for the cyberpunk genre of science fiction. Gibson invented the word and concept of cyberspace in the short story Burning Chrome. He popularized and made known through cyberspace debut novel Nevromantiker. This picture of an information age came before the Internet became common in the 1990s. He predicted the reality TV and artificial environment created through computer games and the web. He is born under the zodiac pisces, who is known for Fluctuation, Depth, Imagination, Reactive, Indecisive. Our collection contains 20 quotes who is written / told by William, under the main topics: Technology, Time, Work. "The future is here. It's just not widely distributed yet"
"I think that technologies are morally neutral until we apply them. It's only when we use them for good or for evil that they become good or evil"
"And, for an instant, she stared directly into those soft blue eyes and knew, with an instinctive mammalian certainty, that the exceedingly rich were no longer even remotely human"
"The box was a universe, a poem, frozen on the boundaries of human experience"
"Language is to the mind more than light is to the eye"
"A graphic representation of data abstracted from the banks of every computer in the human system. Unthinkable complexity. Lines of light ranged in the nonspace of the mind, clusters and constellations of data. Like city lights, receding"
"Cyberspace. A consensual hallucination experienced daily by billions of legitimate operators, in every nation, by children being taught mathematical concepts"
"Dreaming in public is an important part of our job description, as science writers, but there are bad dreams as well as good dreams. We're dreamers, you see, but we're also realists, of a sort"
"The 'Net is a waste of time, and that's exactly what's right about it"
"Generation X is dead. It has come to mean anyone aged 13 to 55 years old"
"Why shouldn't we give our teachers a license to obtain software, all software, any software, for nothing? Does anyone demand a licensing fee, each time a child is taught the alphabet?" "The sky above the port was the color of television, tuned to a dead station"
"For years I have been mourning and not for my dead, it is for this boy for whatever corner in my heart died when his childhood slid out of my arms"
"It's impossible to move, to live, to operate at any level without leaving traces, bits, seemingly meaningless fragments of personal information"
"I don't have to write about the future. For most people, the present is enough like the future to be pretty scary"